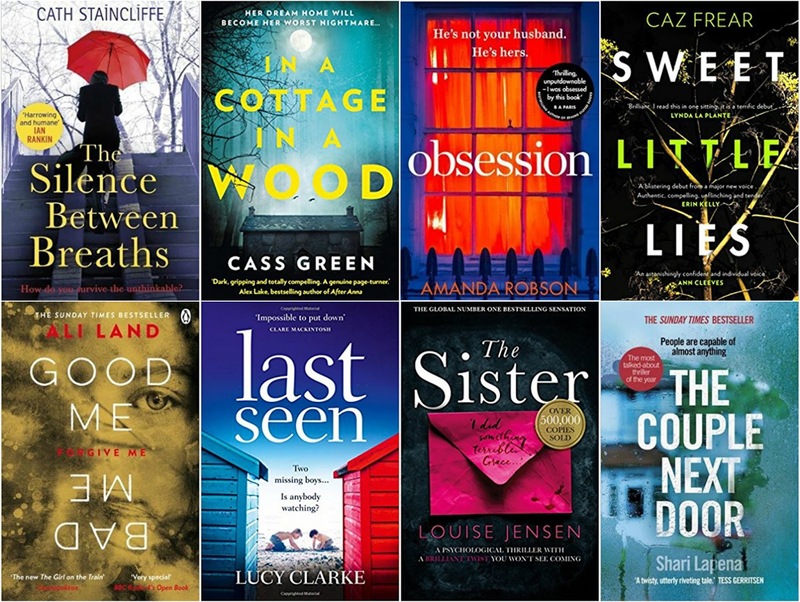 Enter this giveaway for a chance to win eight gripping thrillers. Good luck! I like psychological thrillers because they mess with your head. Such twisted plots. I love a good police procedural where cases are complex and different cases link together by the end. I enjoy playing detective and trying to work out the guilty and then finding out if I'm right. I like thrillers that dip into speculative fiction as a horror/supernatural element gives the plot a whole new dimension (and more goosebumps for me). I like thrillers with a lot of mystery which gradually unfolds throughout the story, really keeps me gripped. I love thrillers that mess with your head, and also ones packed with action! I love all kinds of thrillers! My favorites are the ones with endings that you don't see coming, but that are still realistic (not Behind Her Eyes style). But unfortunately those seem to be few and far between. I love all thrillers, especially the ones that scare and leave you breathless!! I like thrillers with characters I can side with and a plot that keeps me guessing. I love psychological thrillers, ones that get in your head and make you think! I love a thriller with so many unexpected twists and turns that I feel dizzy,with colourful but believable characters,who never turn out to be what they seem.....! It’s a tough call, but I think my favourite thrillers have a touch of science fiction in them. Nothing immersive is necessary, just a hint of sci-fi can be enough. Even some sort of subplot can be enough to tickle the imagination. It could be anything: cutting edge technology, a mutated monster, an alien, or a mysterious artefact. I suppose its a rather open-ended sub-genre. But ideally I like a story that makes me wonder "what if?" Something where I don't necessarily have to suspend disbelief in order to feel engaged. And, ideally, something that seems almost plausible in the end. I love domestic thrillers because of all the plot twists. I love really dark psychological thrillers that have so many twists I don't know what's going to happen next. I enjoy psychological thrillers with unpredictable characters and twists that keep you reading all night. I like a thriller that can surprise me. I really enjoy psychological thrillers. I can't get enough of the what's going to happen next, sitting at the edge of your seat, am I going crazy kind of reading. I also once in a while like to read a good disaster thriller or mystery thriller. My favorite thrillers are psychological thrillers, they usually have a twist at the end that you can't guess! Psychological thrillers are my faves!! I love a crime thriller with a real twist to the ending. Crime Thrillers. I especially love thrillers with serial killers. I love a good psychological thriller as I enjoy trying to figure out what makes people tick. Psychological thrillers are my favorite. I love twists and turns, and love being able to have a scary run through in my head, as I read it kind of book. I love a good thriller with plenty of crime and murder in it. I love a good psychological thriller. Gone Girl is a good example! I like thriller with a little bit of romance, because they are my favourites genders. I love thrillers that make you think and be scared all at the same time. The one that messes with my mind. When I think I have it all figured out and found out that I couldn't be more wrong. I love a good detective who dun it thriller the best. I love a thriller with a twist! Can't beat them! psychological and mystery thrillers. I like the feeling! i love thrillers that have you constantly questioning your own judgement on the characters. that makes a good book for me! I like the ones where they are being stalked and it's more about what might happen or the little things have been moved etc than the violence. One of my favourite books The Night Stalker by Chris Carter has a chapter ending that even made me look over my shoulder when I read it. Dark Room by Steve Mosby is one of my favourite thrillers. I need to be able to follow the characters easily, and it be gripping. I like to be trying to work out 'who did it'? I like thrillers with an m/m romance aspect (usually between cops), because both themes offset each other intriguingly!